This 1910 Parker Model 47 Parker was nicknamed the “Pregnant Parker” because of the bulbous design of the alternating pearl slabs. These pearl slabs are soaked until soft so they can be so shaped – no doubt a delicate and time consuming process. There is a wonderful yellow, green, and red iridescence of the pearl. Gold-filled high relief repousse floral cap and barrel bands. 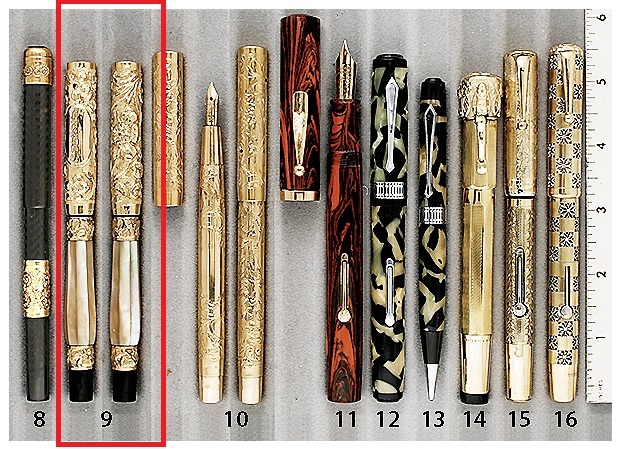 This pen is an eyedropper-filler, and is one of the most beautiful of the early Parker pens.